GMV Miami-November 21st and 22nd! 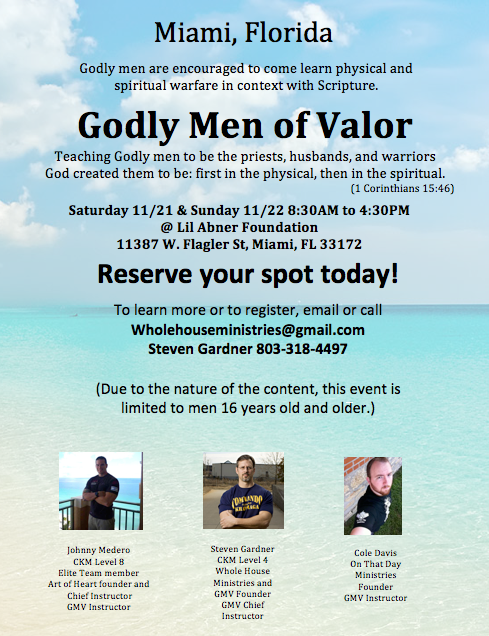 GMV Miami is going to be an awesome time for brothers to come together and train in a beautiful and warm environment. Don’t miss out on the fun! To register for GMV MIAMI click HERE. Eventbrite.com requires a minimum of $1.00 to register. Please donate ONLY $1.00 to secure your spot. Donations will be accepted at the event. If you have any questions about registration or if you have any difficulties registering, please email us at wholehouseministries@gmail.com. Posted on November 5, 2015 November 8, 2015 by wholehouseministries	Bookmark the permalink.